Hi everyone! Most of you don’t know me. I haven’t been on much lately. Life has been busy. 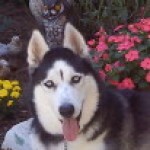 My Siberian Husky was diagnosed with glaucoma 3 years ago. He had his left eye removed 2 years ago. I was living in fantasy land that his remaining eye would last his lifetime. WRONG! We got up Thursday morning and he was blind. Off to the ER we go. His pressure was 87. They got it down to 50 and sent us to our regular vet. When we got there it was down to 15. They sent us to the eye specialist. Put him on 3 different drops and 1 pill. His vision came back. I got home from work last night and he was blind again. Back to the ER we go. His pressure was back in the 80s. Modified his dosage of drops and prescribed pain pills. Not much more they can do. He was blind all night last night. All day today we have kept him calm. He seems to be comfortable. He can see some tonight. We go to our regular vet Wednesday night to determine what to do. I was hoping he would go blind gradually so he could adjust gradually. I need a lot of advise. How do we prepare him and us for blindness? I need a lot of love and help right now. I know he will adjust. But, how do we help him adjust? Was thinking about getting the Tracz stickers. Have they helped anyone? I am scared to go through the removal surgery again. We had some issues the last time. I am thinking about asking the vet to keep him an extra day or two. I am not a nurse. I do not deal well with all this. Never did good when my sons were sick. Thanks for listening or reading!!! I knew exactly where to come for support. I will keep you posted. Kodie is blind again today. Crazy how his sight is coming and going. Have to do what is best for him and I think eye removal as soon as possible is best. Plan to talk to vet tomorrow and probably schedule it. Breaking my heart, but I know he will be fine. I dread so much the surgery and recovery. I pray he makes out better this time. And I pray for a lot of strength for me and my husband. I know exactly what you are going through Debbie. The same thing happened to Lucy. She lost the first eye and then 6 months later we woke up one morning and she was blind in the other eye. With glaucoma it rarely happens gradually, so it’s always a shock. It’s an awful feeling I know. But you were lucky in some ways that his second eye lasted as long as it did, but that doesn’t help you now. I know it all feels terrible right now but it will get better. He will cope with being blind. They are amazing at it. I’ve had this site for a while now and everyone goes through the same process. It’s devastating at first and then after the operation everyone is tense because the dog doesn’t look like it is going to adjust, they look depressed and things are looking bleak. Then I hear from the same people days or weeks later and they are astounded at how wonderful the dog has adjusted. And don’t assume that because your first surgery didn’t go so well that the second one will be the same. Most of these eye surgery’s go quite smoothly. You may be surprised at how well it all turns out. In other words, the odds are stacked towards a positive outcome and not a negative one. You will cope with this Debbie and so will your dog. And you don’t have to do anything specific at this stage to prepare him. He will manage quite well on his own. Just keep everything in it’s usual place so that he can find it. He will map his way around the house pretty quickly. He will bump into lots of things but that is natural. Just take each day as it comes. It will be okay. I am here for you so just keep asking questions. Thanks for the much needed words of support and encouragement. I am so thankful I have you. You got me through the first eye removal and you are going to help me get through the second. Bless you sweet friend. I can’t imagine going through this 3 year process without you and the others that have helped me through.